Frequent visits to the same sites are essential for me to succeed as a fine arts nature photographer. Natural places are never the same, as they respond to varying light conditions, sun angles, weather and seasons. With the camera I am only able to record a small number of these infinite variations, but in doing so, have come to a heightened understanding that the greatest constant in the environment, of which we all are a part, is change. As we encounter day-to-day changes, sometimes with uncertain outcomes, in our own lives, we find comfort in the knowledge that this greater evolution is a natural state to which we belong. Many of our images have been captured in local, state or national parks and other public lands, which offer easy access to the public. The edges, where constant human traffic, often with pets, comes into close contact with preserved natural areas, are particularly vulnerable to environmental damage. Vigilant public awareness and ongoing education are the only tools we have to reduce the self-inflicted erosion on these places of fragile interface. By communicating our visions of these places to others, through striking graphic images, we hope to raise awareness of the need to tread lightly in these natural environments, which we make part of our every day lives. 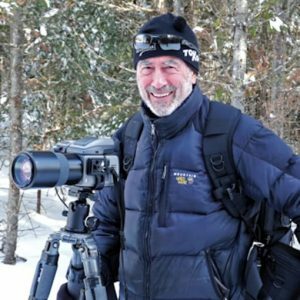 Prior to becoming a professional photographer was the Principal-in-Charge of the Architectural practice at Sasaki Associates for 15 years at the firm’s headquarters in Watertown, Massachusetts and a principal at Orcutt Associates in Maine for 10 years.